The CO2 dental laser is one of the top lasers on the market for treating your gums. 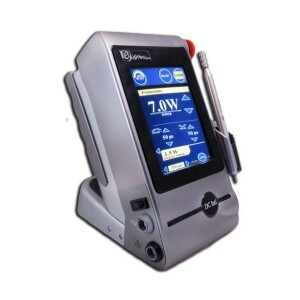 Because the CO2 dental laser provides precise control and an optimal amount of energy through a built in digital feedback system, it is the epitome of easy and efficient. With this dental laser, we can perform a variety of treatments on your gums and restore your gum health to the best possible level. The Diagnodent is one of the best new developments in laser dentistry over the past 10 years. This dental laser helps the dentist find unhealthy teeth earlier so that you will have a better chance at restoring your natural tooth back to full health. Or, even if a cavity has begun to form, this laser will allow Dr. West to preserve more of your natural tooth and make fillings last longer. Ultimately, this laser decreases the chance of tooth sensitivity and will give you a stronger, healthier tooth that is equipped to resist future problems. Laser diodes are remarkably versatile. Our soft tissue laser diode enables Dr. West to make perfect cuts where needed in gum tissue, eliminates bleeding at the site, and reduce healing time. What does this mean to you? A more comfortable dental visit and less sensitivity post treatment. Our diode lasers are also useful in sterilizing root canals and treating periodontal (gum) disease. It provides the optimal amount of comfort: treatment will often be painless. Your treatment will be easy and your mouth will heal quickly. Treatment is extremely accurate, leaving optimal results. If you are in the Boulder area and would like to enjoy the benefits of or have questions regarding leading-edge laser dental technology, call our Lafayette, CO dental office today at 720-216-2298 or fill out the simple form on the right, and we will be glad to contact you.